Coast District Hospital experienced major impact to patient care because many on-call personnel could not be reached when needed for urgent procedures. Physicians were unreachable by cell phone or Internet-based messaging. Health club couldn’t check in members. Pharmacy couldn’t verify insurance coverage. Grocery stores couldn’t charge cards. Fire chief had to drive to find a landline phone to make and take calls. Auto mechanic couldn’t do his job because all his repair manuals are on-line. Inns unable to access online reservations. These are only a few anecdotal stories that emanated from the fiber cut last Sunday; some of minor importance, some had economic impacts while others were serious health and safety problems. Since last Monday the Broadband Alliance of Mendocino County (BAMC) has been working closely with the Mendocino County Executive Office to create an online survey to collect and assess the widespread damage caused by the accident. The survey went live Wednesday evening. While feedback has covered the gamut from potentially life-threatening to outrage to thoughtful suggestions to the inconsequential, a common theme is evident – the status quo of telecommunications infrastructure in Mendocino County is unacceptable going forward. Everyone’s lives from school age children through senior retirees have transitioned into a 21st century digital world and completing even the simplest of daily transactions requires Internet connectivity. This includes schoolwork and distance learning, telemedicine, credit card purchases, banking, social security payments, LIFELINE health monitors, EBT payments, job applications, etc. Regardless of the device one uses, this connectivity depends on “middle mile” fiber to connect to the world. When the Comptche Road fiber was breached service was disrupted because this particular network had no redundant “back-up” line over which the traffic could be re-routed. The BAMC has been working tirelessly for more than four years to bring proper broadband connectivity to the county – to close the Persistent Digital Divide for the estimated 50 percent of county households that have no or substandard broadband connectivity. It is unfortunate that the out-of-state corporations that control what amounts to a telecommunications duopoly in the county have thwarted our major initiatives. One such initiative was the Golden Bear Broadband (GBB) project that was designed with a robust and redundant middle-mile fiber network; an essential element of proper network design. What happened to the GBB project? After 13 months awaiting approval at the California Public Utilities Commission (CPUC), the GBB board withdrew the application because of the fierce opposition by the aforementioned duopoly and five other carriers. While these firms have no plans to build out their own networks, they have inexplicably blocked the Alliance’s efforts to get the job done. The CPUC recently stated that “…Mendocino County has the largest population of unserved residents in California.” While this is an unambiguous statement of the need, the State’s telecommunications regulator was also unwilling to approve the GBB project. Since the big guys won’t do the job, we need a homegrown solution. Let’s “go local.” The Alliance has plans along these line to pursue other funding sources which will need the public’s full support. Stay tuned. 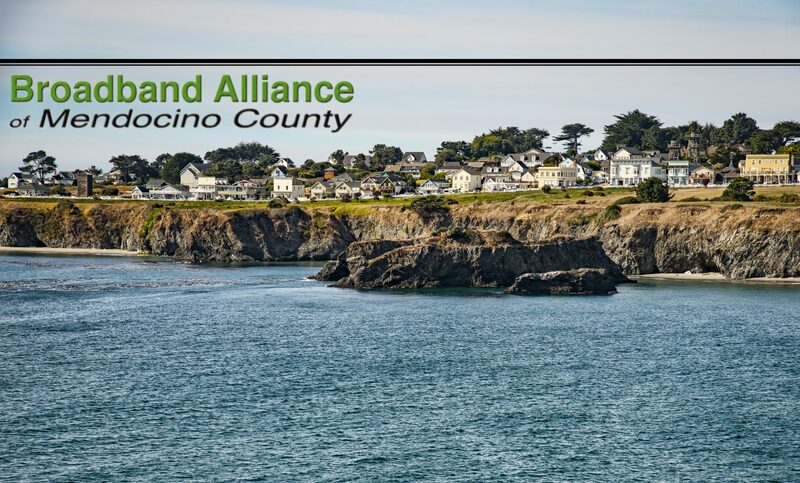 The Broadband Alliance of Mendocino County is a partnership of the Mendocino County Board of Supervisors, County Executive Office, Community Foundation of Mendocino County, Economic Development and Financing Corporation, and the Mendocino Coast Broadband Alliance. The Broadband Alliance of Mendocino County is a member of the four-county CPUC-funded North Bay North Coast Broadband Consortium. The May 2014 report to Redwood Coast Connect is available for download on the Data and Reports webpage. The notes from the May 30th meeting of the Broadband Alliance steering committee are now available.